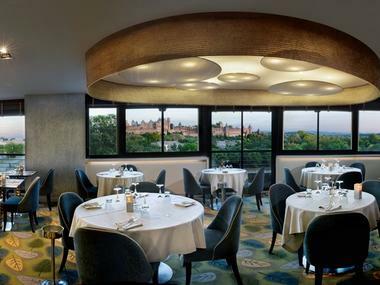 Panoramic restaurant on the 4th floor of the Hôtel des Trois Couronnes, opposite the medieval city in a quiet district just a 10-minute walk from the city and 5 minutes from town's shopping centre. From April to mid-October, a summer terrace is set up facing the city of Carcassonne and next to the River Aude. There is no review about Restaurant Panoramique Les Trois Couronnes, be the first to leave one !